The Sochi Winter Olympics 2014 were undoubtedly the social media event of the year and offered fertile breeding ground for sports related content marketing. Many brands were living and breathing the Olympic Games with their fans in Twitter but one of them took things a bit further than just tweeting about the results in real-time. NHL has already aknowledged its position as the world’s number one ice hockey league and offers serveral different language versions of its official webpage for the internatonal fans. During the Sochi Olympics NHL took things even further and engaged with their international fans by tweeting in their native lauange. I first came across this delightful new approach when official Twitter account of NHL tweeted in Finnish immediately after superb performances of young Pittsburgh Penguins defenceman Olli Määttä. 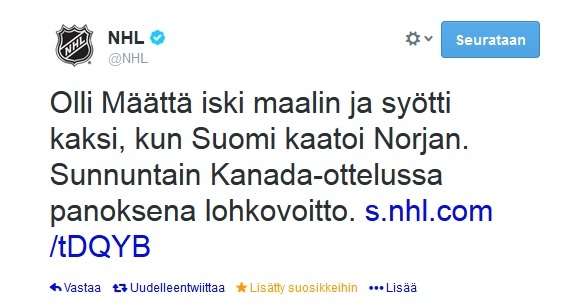 Like many others, at first I couldn’t believe my eyes but soon I learned that it wasn’t even the first tweet in Finnish by NHL during the Olympics — and they came in Swedish too! Tweets in exotic foreing languages sure did stir up some confusion amongst the English-speaking majority of account’s 2,3 million fallowers but judging by the great engagement rates it sure was a trick that should be added to playbooks of other international brands as well. Even though the Sochi Winter Olympics are long gone, in my books, engaging with international fans in this simple yet clever way is enough to award NHL the gold medal in the Twitter Olympics.